You can do lot's of things with this template! Just print the template out on peel and stick paper and cut them out. You can buy this from Wal-Mart. Add the stickers to children's notebooks, papers, stick to lunch bags, ziplock bags, jars filled with treats, scrap-booking, kids shirts, white cups filled with popcorn, etc. Just print this template out on magnet paper. Once again you can get this from Wal-Mart. Hand out to the kids during class time for them to take home and hang on the refrigerator. Or use for prizes. Just print and cut out. Pass out popsicle sticks and stick glue to the kids. 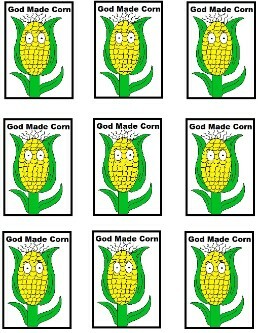 Hand their little picture to them to glue on the stick for a God Made Corn Popsicle Stick Puppet. This craft would be for smaller children to do. Older kids would not get much of a kick out of this craft. lol. Believe me I know. Just print these out and laminate if you want. Cut the pictures out and tape a toothpick to the back of the picture and stick down in cupcake. These would make an awesome snack for kids during Children's Church to go along with the Corn Sunday School Lesson that we offer. Just print the sheet out and hand out to the kids. Let the kids cut all 9 pictures out. Have the kids cut the middle out of a paper plate and then glue down the 9 pictures all around the rim of the paper plate. Attach a yellow or green yarn to the back with some tape so they can hang it up. You could let them hang these on a fall tree if you have one in your room or hang them on your fall bulletin board. Just print and laminate. Cut them out and staple them all over your bulletin board. You could hot glue real popcorn to the bulletin board too. 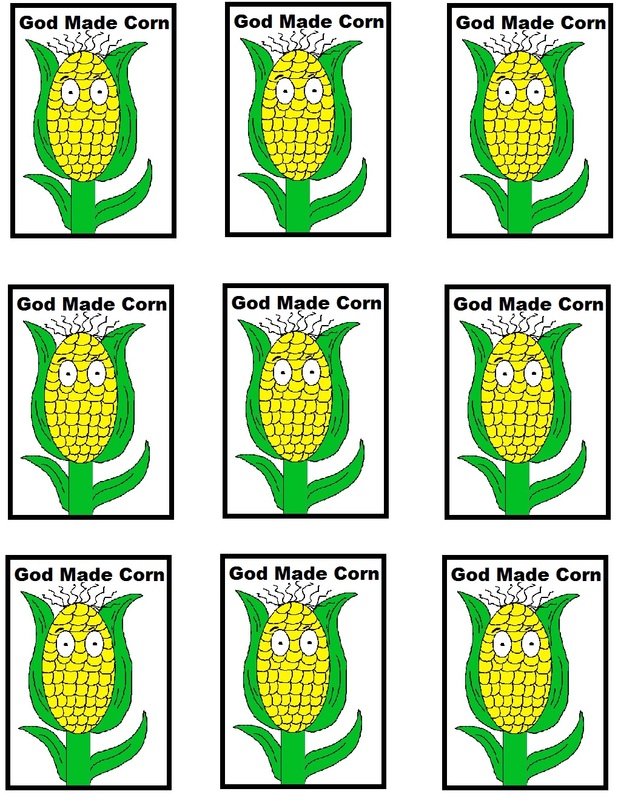 Spell out the words, "God Made Corn" across the top of the board. You could add some other words like, "FALL-ing for Jesus" or "God Made Fall Time". You could also staple corn husks all over the board and draw a corn underneath it.